Plaintiff's attorney Daniel Smith, left and defense attorney Richard Womble, right, deliver their closing arguments. Click here to see video from the trial. Orlando - A Florida state court jury sided with a waste disposal company on Wednesday in a lawsuit filed by a cyclist who was severely injured in a collision with a 15-ton garbage truck, rejecting his claims for up to $12 million in compensation for injuries that will likely require the amputation of his leg. A unanimous panel of six jurors deliberated for just under two hours following a weeklong trial before sinking plaintiff Thomas Truong’s allegations against Waste Services of Florida Inc. and truck driver William Bocker. Truong’s attorneys accused Bocker of driving at an unsafe speed and failing to check his mirrors when he collided with Truong on Orlando’s John Young Parkway in 2012. However the company maintained that Truong caused the accident by trying to speed past the truck to cross an intersection despite Bocker activating his turn signal. Truong suffered severe injuries to his arms and legs in the collision and was hospitalized for more than 200 days as he battled multiple antibiotic-resistant infections. He is still not fully recovered, his attorney Daniel Smith of the Coye Law Firm argued during his closing statement, telling jurors that Truong’s left leg will probably require amputation and asking for up to $3 million for pain, suffering and medical expenses since the accident and up to $9 million for the future. 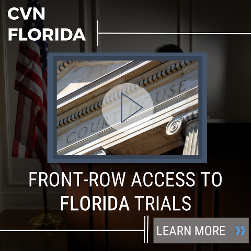 The trial was webcast and recorded gavel-to-gavel by Courtroom View Network. Waste Services retained the 62-attorney firm Rissman Barrett Hurt Donahue McLain & Mangan PA, one of Florida’s go-to defense firms for high-exposure cases. Richard Womble, a partner in the firm’s Orlando office who delivered the company’s closing argument, told CVN he felt the jury was ultimately swayed by the testimony from Truong and Bocker themselves. Womble said there was no high/low agreement in place prior to the jury starting deliberations, and that a $1.3 million lien imposed on Truong by the hospital that treated him made reaching a potential pre-trial settlement difficult. Wade Coye, who also represents Truong, told CVN that some people hide their biases about the role bicycles and large trucks play in traffic accidents, and that some jurors had probably made up their minds on the day the trial started. "If they realistically were unbiased and realistically listened to the testimony there would have been some form of comparative negligence on both parties," Coye said. While Truong’s attorneys have 10 days to file a motion for a new trial, Womble said they didn’t make any arguments to Judge Keith White after the verdict was announced regarding potential post-trial motions or an appeal. “In my view it was a clean case and there are no potential appellate issues,” Womble said. However Coye said he may file a motion for a new trial on the basis of Judge White refusing to grant a jury instruction allowing jurors to infer that video from inside the garbage truck's cab that Waste Services failed to preserve contained information contrary to the company's position. Coye said Waste Services lied about the existence of video from within the cab for years, and that by the time an employee made reference to it during a deposition the video had already been destroyed. While he indicated that a jury instruction to that effect would have been important, he expressed pessimism about the prospects for a motion for a new trial on that basis. “Our likely view is that it's going to be denied, and I’m not so sure that the appellate court is going to provide relief in this situation,” Coye said. Womble said he believed that given the severity of Truong’s injuries and the magnitude of the damages sought, that his attorneys were hoping the jury would side against Waste Services but split responsibility between Truong and Bocker, and that even a 50 percent reduction in responsibility would still result in a “massive” award. “I think that was always the strategy and the intent of the plaintiff’s attorneys,” Womble said. Waste Services is entitled to recover their taxable costs from the litigation, Womble said, noting that the company might forego any efforts to recover additional costs if Truong agrees not to pursue an appeal, however he stressed a decision on that had not yet been made. “That is undetermined at this time,” he said. Coye said what lies ahead for Truong in the wake of the verdict is uncertain. The case is Truong v. Waste Services of Florida Inc., case number 2013-CA-00353, in Florida’s 9th Judicial Circuit Court in Orange County.